Your "krewe" will know you really covered all the details with these Mardi Gras theme party candle decorations - express your joie de vivre and let the good times roll! The Mardi Gras Parade, the krewe floats, the awesome costumes, the throw beads, the revelrie, the masked ball and the oh so fabulous food...there's no place else like New Orleans! Your event tables will glow with the spirit of Fat Tuesday when you use them to set a fun and fabulous mood at place settings or as centerpiece ideas. 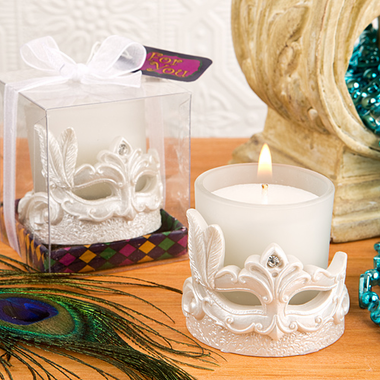 Your guests will remember the festivities long after when you give the mask candles as Mardi Gras souvenir gifts! Each is packaged in a transparent box with bright pink, green, purple and yellow harlequin color on the base. The molded poly resin white masquerade mask candle base is designed with a fleur de lis and feather detail with a rhinestone accent and comes with a white poured candle in a frosted white votive holder. They measure 2"x2" and come with a general use "For You" tag.